Six banks repaid nearly half a billion dollars in funds they received from the government bailout of Wall Street, the Treasury Department said, bringing the total bank repayment under the Troubled Asset Relief Program to 99%. The Treasury on Wednesday said the banks repurchased TARP investments with proceeds to taxpayers totaling about $475 million. 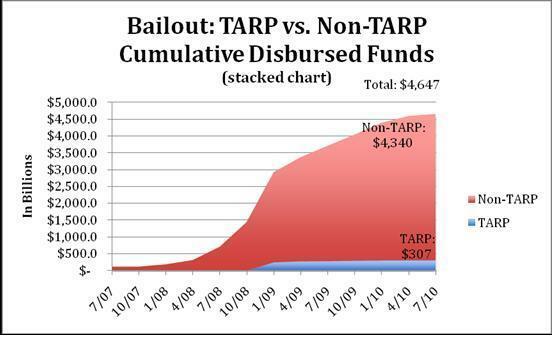 TARP was created in 2008, with its Capital Purchase Program set up for banks hurt in the financial crisis. Through the repayments announced Wednesday, as well as dividends and interest, taxpayers have recovered about $244 billion of the $245 billion in TARP funds disbursed to banks, the Treasury said. The Treasury currently estimates that bank programs within TARP will ultimately provide a lifetime profit of nearly $20 billion to taxpayers. From the Treasury's lips to your eyeballs, courtesy of the Wall Street Journal and others. We've been through this before, yes? Back in July of last year, it was, "Thus ends the much-maligned 'Wall Street bailout.'" Except it didn't end. In early March, it was, "There is now broad agreement that the bailouts worked, stabilizing the financial system and preventing an even deeper crisis." But the agreement wasn't broad enough, for an ample number of reasons. But now TARP is almost paid back, we're told, and taxpayers have earned $20 billion, to boot. While it is true that many TARP bailout programs have ended, Center for Media and Democracy research shows that money is still due to taxpayers under the TARP. More importantly, the research shows that the U.S. Treasury Department's ten TARP programs represent less than seven percent of the $4.7 trillion disbursed by the U.S. government in an effort to aid the financial services industry. Far more money has been disbursed by the Federal Reserve to prop up the financial system than by the U.S. Treasury and those loans are still outstanding. The first graph shows that non-TARP expenditures, largely by the Federal Reserve, dwarf those of the TARP. It is absurd to declare 'mission accomplished' while counting only one small portion of the bailout. 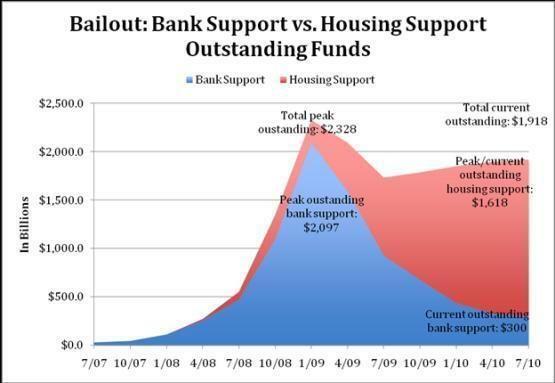 While the Federal Reserve aid was disbursed mostly in the form of loans, that money has not been paid back yet, and in the housing sector this disbursal of funds continues in what we like to call a "stealth bailout." Our unique timeline of the bailout derived from government data pulled on a quarterly basis, clearly shows the initial infusion of some $2.7 trillion in emergency funds into the financial system, followed by a second infusion of funds into the mortgage and housing markets, largely through Fannie Mae and Freddie Mac and without a vote or any Congressional oversight. It represents the largest intervention in the housing market in history, yet it is not getting any of the scrutiny that has been applied to the TARP from policy experts, policymakers or the press. As I've been saying for a long while, TARP is just a fraction of the overall taxpayer intervention in the financial collapse, and we are far from recouping 99 percent of that. The above charts, obviously, have not been updated since last year, but Mary Bottari, the director of the Real Economy Project, told me Thursday, "My guess is that we are not too far off these numbers still," adding, "TARP was never the big enchilada. It was always the Fed, and the Fed's exposure still remains in the housing sector, where they have pumped billions in an effort to prop up the housing market." The Real Economy Project tracks the total Wall Street bailout cost on this page at SourceWatch, which exhaustively runs down that enchilada. Sorry to rain on the parade, everybody!